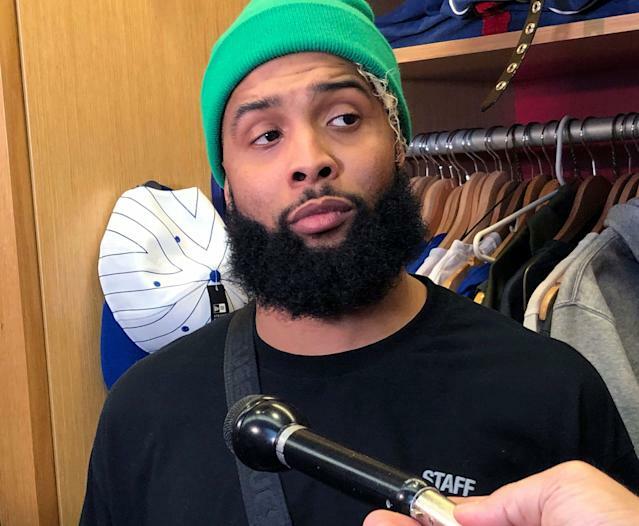 The New York Giants trading Odell Beckham Jr. to the Cleveland Browns on Tuesday took everyone by surprise, and that includes one of the star pitchers for another New York team. New York Mets pitcher Noah Syndergaard spoke to the media after his spring training start on Wednesday, and was just as confused about the Beckham trade as everyone else. “I don’t know what the Giants are doing.” Someone needlepoint that onto five million pillows and send them all to GM Dave Gettleman’s office. Then maybe he’d shed some light on this truly puzzling trade. Cut Thor a little slack. He is a baseball guy, after all. And he had just finished a sparkling spring training outing (two hits and zero runs over 5.2 innings) against the Houston Astros, during which he stood on a mound. Syndergaard doesn’t need to be forgiven for his Baker Mayfield/mound slip-up. Not after speaking the truth about the Giants. Get it together, Giants. You’ve lost Noah Syndergaard and “Game of Thrones” author George R.R. Martin. Who’s next? Tracy Morgan? Spike Lee? Lady Gaga!? When will the madness end?